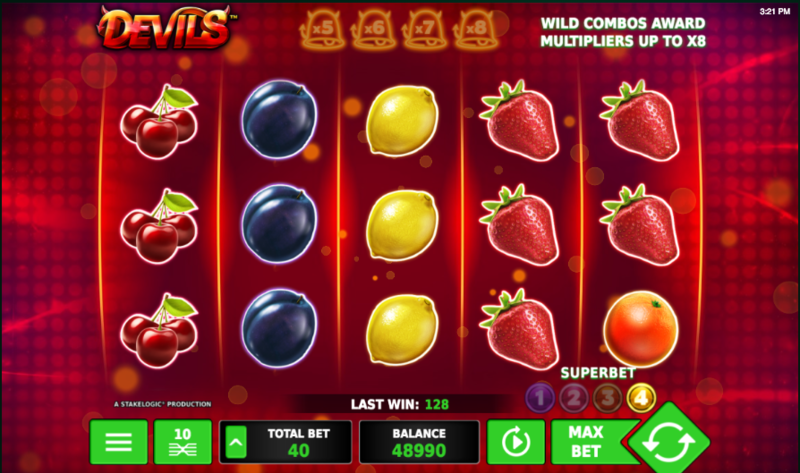 The combination of fruit and the ruler of the underworld is a strange one which doesn’t sound all that tasty but those ingredients come together to entertain us in this online slot from Novomatic; it’s called simply Devils and it offers four different betting options. Devils is a five reel slot with three rows and ten fixed paylines; as you can see from the screenshot above the dominant colour is red and there’s a hazy scarlet melange visible behind the transparent reels. Aside from the neon devil and the glowing red seven, the symbols are all fruity in nature and include strawberries, grapes, plums, oranges, lemons and cherries. The wild symbol is a red bell/devil combo, it appears on reels two, three and four and it will substitute for all other symbols to form winning combos; it also has a bonus feature which is explained below. As well as doing all the usual stuff, the wild symbol will expand each time it appears on the reels; it will then freeze in place and a free respin will be awarded. A wild multiplier will also be awarded, the value of which depends on which Superbet level you are losing. Level One – default level, no multipliers. Level Two – stake x2, win multiplier up to 4x. Level Three – stake x3, win multiplier between 3x and 6x. 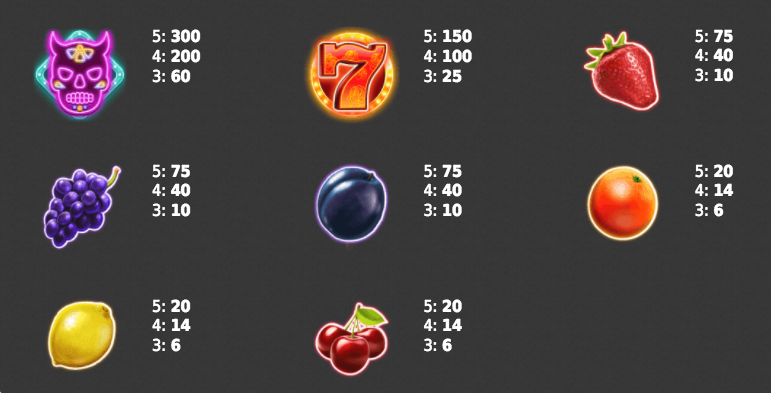 Level Four – stake x4, win multiplier between 5x and 8x. Devils is an interesting little slot which is not overburdened by bonus features but it’s enjoyable stuff nonetheless and it’s designed to a high quality. If your budget allows, use the Superbet options for a bit more excitement; this game comes with an RTP of 95.57%.